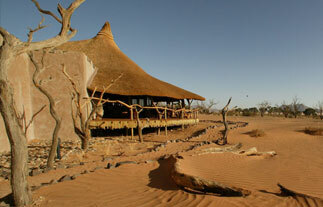 L ittle Kulala is located in Kulala Wilderness reserve, the only reserve with direct access to the towering sand dunes of Namibia's extraordinary Sossusvlei desert, making this camp the ideal base to explore the region. Little Kulala Camp is a luxurious desert retreat with only eleven climate-controlled villas, that merge impeccably into the timeless desert landscape. Accessorized with designer fittings and fixtures, the innovative villas offer bleached timber decks, each with a private plunge pool for cooling off in the afternoon siesta hours. 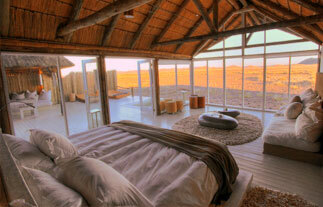 In addition, each desert villa also has a rooftop 'skybed' for romantic stargazing along with indoor and outdoor nature showers. Guided game drives in early mornings take you through to the spectacular towering dunes through a private gate in Sossuvlei reserve. 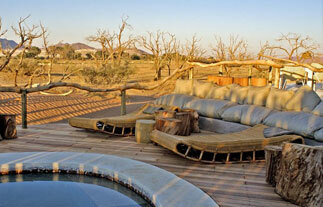 Guided walks are also available in the private reserve offering incredible landscape views and desert game viewing. 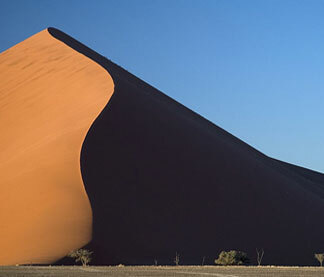 Another option available at additional cost is an hour's Hot Air Balloon Safari at early dawn that offers a very unique perspective while soaring silently above the magnificent sand dunes and desert of the Sossusvlei, ending with a luxurious champagne breakfast in the desert. Little Kulala's Activities: Day drives take you through the Sossusvlei, the oldest desert in the world, and though this is not a game rich area, the wildlife available is interesting and dramatised by the contrast between the desert and the creatures that manage to survive in these harsh conditions, such as Springbok, Gemsbok (Oryx) and Ostrich. Guided night drives often encounter small mammals such as rare Bat Eared Fox, Aardwolf and sometimes Spotted Hyena. 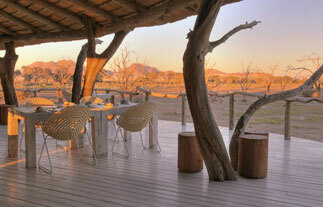 Afternoon nature drives, walking or quad bike adventures are enjoyed in the private reserve where guests can spend time taking in the desert scenery and its unique fauna and flora. 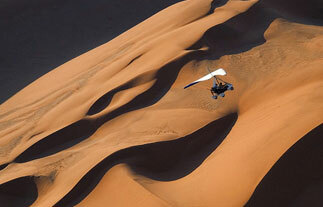 Incredible balloon safaris over Sossusvlei are optional. Other unique activities include microlighting. "One would think that after 16 months in the Namib, you've more or less been surprised with every aspect of wildlife - or in this case I should probably say desert life. This is another story about adventure and enjoyment, but more about enthusiasm, love for one's job and specifically my love for Namibia. I've said this many times and I'm going to say it again: "The desert never ceases to amaze me". I came back after my leave, thinking I'm coming back to the place I left behind. Over the last few weeks there has been some rain in the area, especially in the Naukluft Mountains, and this caused the Tsauchab River to come down - which means that Sesriem Canyon has still got some water in it. It's the fourth time that the Tsauchab has come down over the last two months, every time for less than a day, but the point is, it came down! This story is partly about what came down with the river, but more so about the happenings of the few days around this particular incident. As I said; I came back from my leave, and upon arrival on the Kulala Wilderness Reserve was told that I was picking up guests at the airstrip in 40 minutes. This is where yet another of my amazing desert-adventures started - and like all the other ones - filled with appreciation and wonderful memories. I went for the pick-up, and from there onward the 'sightings-fairy' poured her whole bag of magic dust over us. On the way to the lodge we started off by seeing a Karoo Chat - for those of you not into birds, I haven't seen this particular species more than five times on the reserve. Then I just knew that it was going to be a very special next few days. Another bird we saw on start-off was Grey's Lark (a semi-endemic to Namibia), not very uncommon but sometimes weeks go by without seeing any, and just the fact of it being a semi-endemic means a lot. 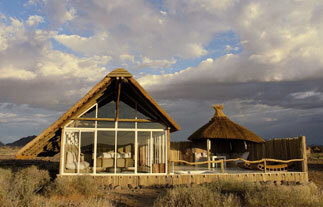 To top the day, we had an amazing nature drive with a sunset that only the Namib and a few clouds are able to dish-up. Next day was ballooning morning for my guests, after which we did a Sesriem Canyon excursion - this is where the greatest finding of these few days happened. We where walking around the canyon, talking about the history, geology and all that kinds of stuff, and then went down into the canyon to have a closer look at the stagnant water. We couldn't really walk around down there since it had quite a lot of water - and I should add that it was dirty, stinking, rotten water that has been standing in the hot desert sun for more than two weeks. So we walked around, took a few photos, and on the way out I saw something moving in the water. At first I thought it was a Common Platanna - Xenopus laevis - which made sense, since I've seen them in the pools of the Naukluft Mountains. Then at closer inspection I could clearly distinguish the shape of a fish. The first thing that went through my mind was: "You're crazy man, the desert sun is already getting to you!" Luckily I had my camera with me and as I moved closer I saw it. It was a fish! After some research, here is a bit of the info I gathered: Common name is the Sharptooth Catfish - Clarias gariepinus. 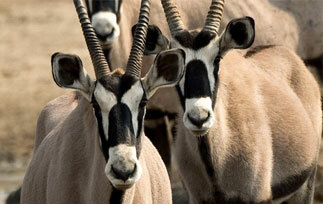 There are more than 2000 different species in the family worldwide. Because he breathes through lungs, unlike almost all other fish species, he's able to withstand certain periods of time outside the water. If necessary, they extend their pectoral spines, which enables them to crawl overland under damp conditions, in other words, 'walking fish'. They occur in almost any habitat but prefer floodplains, large sluggish rivers, lakes and dams - which explain now why they occur in Sesriem Canyon. They are completely omnivorous and feed on almost anything, from frogs and birds, to shrimps and rotten fruits. That was a very special experience for myself, as well as the guests, since it was the first time I saw or heard of fish in the canyon. It was also one of those things that prove how enthusiasm runs over to the guests when you really enjoy what you're doing. That afternoon we did a sundown walk. This was also a big highlight because we saw so many bird species, and like the Chat, some species that are not common at all. We saw a group of Common Scimitarbills - family of the Woodhoopoes - and this was only the second time I saw this species in the area. At the end of the day we saw more species of birds than what I normally see during a whole week. That afternoon was time for another nature drive, and on this drive I experienced Mother Nature in her wrath with the greatest, biggest sandstorm, combined with sunset I've ever seen in my life. Try to imagine a sandstorm so bad that you cannot see any dunes or mountains further than 1km from you. Now add a sunset to that cloud of dust - almost unimaginable, but marvellous. The next morning was unfortunately the last that my guests and I could spend together - at least we could fit in another walk before they had to leave. So off we went again, on another very interesting desert exploration, and like all the other ones, with lots of surprises. Again we saw a very unfamiliar face, this time in the shape of a Pririt Batis, and again, only the second time that I've seen this bird in the area. Sometimes people wonder: "Why do you like to stay in the desert, why do you want to live in Namibia, why do you love this place so much?" - Why am I getting emotional thinking about these questions and the happenings of the last four days? Read my tale again, and then you'll know the answers to all the questions!"